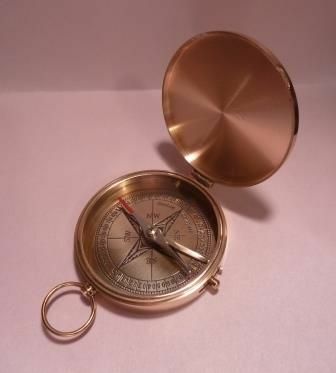 A 3" diameter solid brass pocket compass with completely flat cover perfect for engraving. Your brass pocket compass will come with gift box and draw string pouch(pocket compass only) for safe keeping. This beautiful 3" diameter solid brass pocket compass is a reproduction of a large antique pocket compass. There is a small lever on the side of the compass that operates a needle lift mechanism to protect the compass bearing. The compass is 3" in diameter, 11/16 inch thick, and weighs 8.4 ounces. The compass rose is graduated in degrees and has a standard surveryor's 0-90 degree scale from North to South. Monogram: Enter INITIALS (FIRST,MIDDLE,LAST) optional, $10.00. The initials will be engraved in that order, all caps. Example: Henry David Thoreau is HDT. PERSONAL INSCRIPTIONS can be added to this brass pocket compass. Your inscription will be on the top cover of the pocket compass (or the back cover if you are also adding INITIALS to the compass). Enter your engraving request in the lines above(4 lines, maximum 30 characters per line). We will take care of centering and the engraving layout. If you order initials and an inscription the initials will be on the top cover and the inscription will be on the bottom cover. We do not engrave the interior covers. You May Also Like: Medium Solid Brass Pocket Compass .